The fastest and most economical way to restore a healthy appearance to dormant or discolored turf. GREENS COAT™ turf colorant is a versatile green pigment which will not harm turf grass and can be applied at any time during the year. A super concentrated green pigment with Bright-Fast™ Technology. GREENS COAT’s proprietary Bright-Fast™ blend combines optical brighteners and light-fast color to help bring the look of life back to dormant, semi-dormant or damaged turf. Great for use on Athletic Sports Fields, Golf Courses, Home or Commercial Landscapes. On dormant grass, use a mixing ratio of 32-64 oz. per acre with minimum 50 gallons of water. Higher concentrations will provide a darker hue and additional water will achieve a lighter appearance. Use a low pressure backpack, walk behind or ride on sprayer with a flat fan tip or cone attachment to produce the best coverage. Two perpendicular applications are recommended for uniform results. On dormant turf one application will last at least one season. On non-dormant turf apply every two weeks by spraying in both directions or as needed for optimal results. 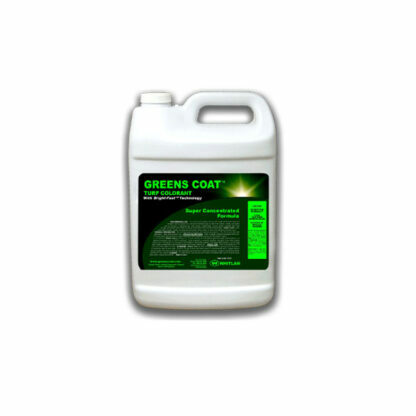 Do not apply GREENS COAT™ if wind or rain will be a factor. GREENS COAT™ it will not transfer to other equipment or uniforms after it has dried. Proper clothing is recommended while mixing and applying. Clean hands, clothing, equipment, tanks, nozzles and screens immediately after use with soap and warm water.